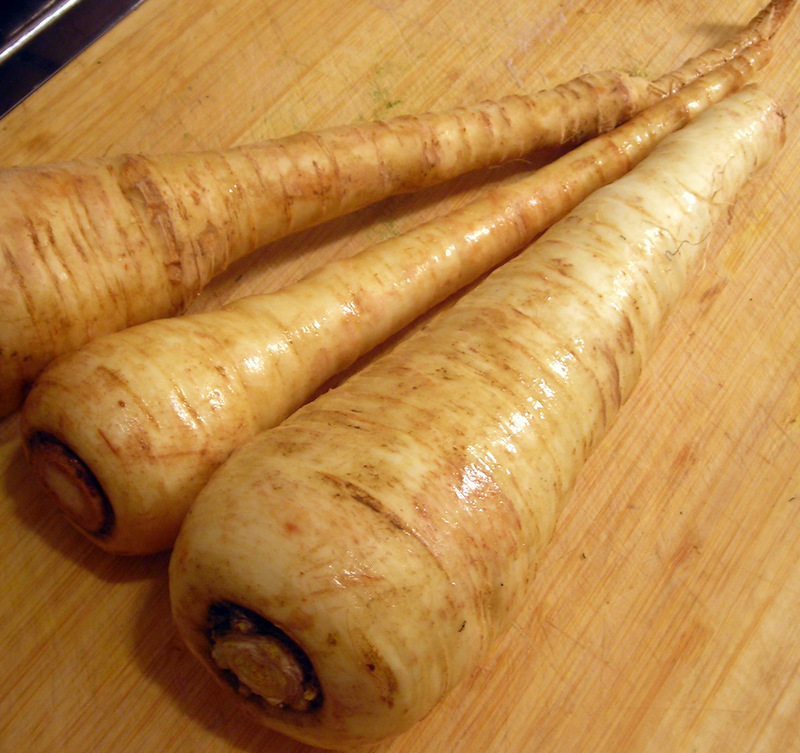 Parsnips are the red-headed stepchild of winter root vegetables. Although they resemble carrots, they are paler and have a sweeter taste, especially when cooked. Parsnips can be boiled, roasted or used in stews, soups and casseroles. In some cases, the parsnip is boiled and the solid portions are removed from the soup or stew, leaving behind a more subtle flavor than the whole root and contributing starch to thicken the dish. Parsnips can also be thinly sliced, fried and made into chips. Most people tend to either like them or loathe them; the latter claim that parsnips, especially when roasted, have a very pronounced flavor such that a foil or contrast is often needed. Mario Batali (who you may know from his stint at The Food Network) regularly features parsnips during his winter menus at restaurants such as Babbo and Lupa. Here, this humble winter root vegetable appears in a butter-based sauce with crispy pancetta, fragrant parsley and Parmigiano-Regianno cheese, and served over fresh tagliatelle. 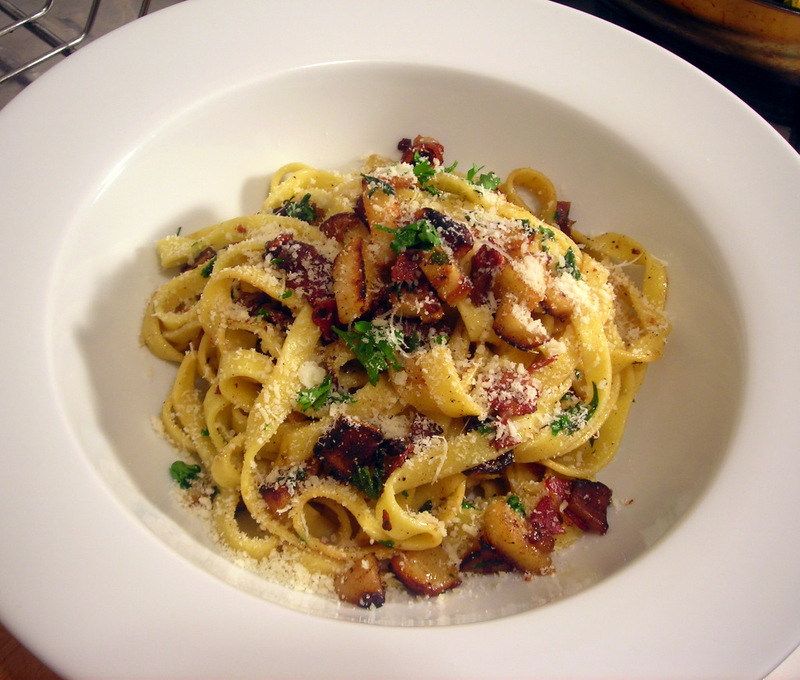 Tagliatelle with parsnips and pancetta; recipe by Mario Batali. 10 Feb	This entry was published on February 10, 2012 at 2:22 am. It’s filed under food, food photography, general, Italian food, winter and tagged dinner, food photography, Mario Batali, pancetta, parsnips. Bookmark the permalink. Follow any comments here with the RSS feed for this post. you’ll be tempted to add to the recipe. my advice is: don’t. although, please be sure that the parsnips are fairly young (and hence will be more tender and sweeter). mature parsnips won’t work nearly as well. I like rutabagas, but I get them mixed up with parsnips. I have parsnip in the refrigerator…I’ll be making this.